A sure sign that your flower garden is truly abloom is when you see nature's popular pollinators - butterflies and bees - busying themselves, fluttering and flying from one flower to another in a feeding frenzy. Such is the case in the garden at our backyard. For several weeks already, bees have been grazing my ear whenever I visited a little corner in my backyard. This corner, as shown in the photo below serves as a tiny nursery of sorts. Here I grow seedlings of different plants, both ornamental and vegetable. This area gets filtered light and is well-protected from the harsh afternoon sun. The bees do not bite and are not in swarms. They're not noisy either. I didn't give them much thought although I found them annoying at times and likened them to flies. In the garden nursery, I store a few spare plastic potting bags and unused empty garden pots. One of the empty garden pots is an ordinary small garden clay pot that's virtually undisturbed. It was inverted to function as a small flat stand for a seedling bag as shown below. I didn't even find it strange that not a few bees would enter and leave the drain hole of the inverted empty garden pot. This went on for few weeks. It was summer after all. One day, however, I saw a trail of red ants lining the side of the inverted garden pot from the ground towards the pot's drain hole. At the same time, a lone bee was struggling to get out from the drain hole. Suddenly, I realized that the usual bee activity seemed to have diminished in the last few days. Was the bee activity replaced by a growing trail of red ants? Did the bees die? Or were dying as indicated by the struggling lone bee? After brushing away the trail of red ants with my hand, I lifted the inverted garden pot. Nothing was on the ground. But the empty garden pot seemed a bit heavier. I peered underneath into the inside of the garden pot and it wasn't empty at all! There were five honeycombs inside the size of small dinner plates. The picture still shows the four honeycombs positioned at the bottom of the garden after I pulled out one. The five honeycombs were hanging vertically and apparently stuck to the bottom inside of the inverted garden pot. I don't think any of them was touching the ground. Initially, what I saw inside the garden pot gave me a bit of scare, I must admit. I've never seen a real honeycomb upclose before, whether honeycombs in a beekeeping business or otherwise. 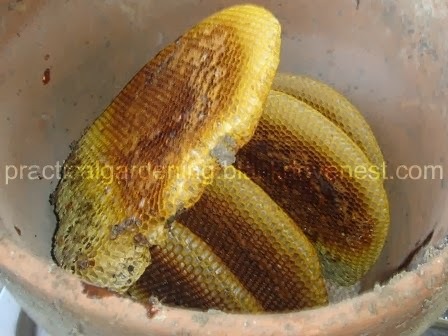 So when I saw the rounded yellowish sides of the honeycombs, I thought it was a snake. The regular pattern of the honeycomb cells looked like the scales of a yellow-colored snake. The thickness of the honeycombs was roughly an inch, so the rounded edges resembled the body position of a coiled snake. And the ants? My guess is they were in for the honey. I suppose the next question now is how to extract the honey from the honeycombs.